Return flights from one of these airports depending on availability of flights: London Heathrow / Gatwick / Stanstead / Luton / London City Airport. This itinerary is subject to change in reverse order. However you'll not miss out on any excursions. After breakfast enjoy a full day tour of the Algarve coastline. You start by a visit to the fishing town of Portimao as well as the Moorish and gothic quarter of Silves. Later you proceed to the school of Prince Henry in Silves. Finally you visit the cliffs of Cape Vincent, the peak point of Europe. This cape is the south westernmost point in Portugal. And is also the landmark for a ships traveling to or from the Mediterranean. The cliffs rise nearly vertically from the Atlantic to a height of 75 meters. Post breakfast you depart for the area of Quarteira which dates back at least to Roman times. King D. Dinis granted Quarteira its charter on 15th November 1297 and it became a city in 1999. From a simple fishing village, Quarteira has become one of the major tourist centres in the Algarve, famous for its golden beaches, its high quality fish and for its woods of stone pine. This area is famous for its bargains. Enjoy bargaining for the colourful Portuguese pottery. Later return to the hotel for a relaxing evening. Today enjoy a full day on the beach where you will have a picnic lunch as well as indulge is some group games. This evening you have a traditional Garba night on the terrace. 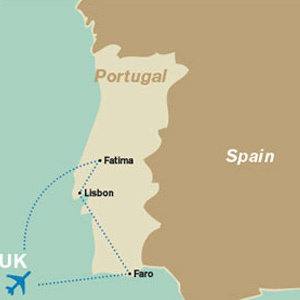 After breakfast depart from the Algarve and drive northwards to the capital city of Lisbon. Upon arrival you start with a sightseeing tour, which includes Lisbon's special highlights such as the Avenida da Liberdade with its mosaic-lined sidewalks, The Black Horse Square, Park Eduardo VII, as well as visit to Jeronimos Monastery built in Gothic Manueline architecture. Later visit the Radha Krishna Hindu Temple. This morning you proceed to the religious city of Fatima, the place where the Blessed Mother appeared in 1917 to three simple shepherd children and exhorted mankind to pray for world peace. Enjoy the beauty of this spiritual town. You will see the Basilica, the site of Francesco and Jacinta's graves, the Hamlet of Aljustrel, where the children lived, and Valinhos, the site of Our Lady's appearance after the children's return from prison. Late evening return to Lisbon. . This morning enjoy a spot of shopping before being transferred to the airport for your return journey home.